We live in a golden age of superhero television. Hits like The Flash, Agent Carter, Arrow, and Agents of SHIELD dominate our TV screens. We champion them for their ability to bring some of the most mind-melting comic book sagas to TV—but one show did it all before them, nearly a decade ago: Justice League Unlimited. 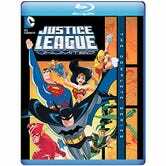 Justice League Unlimited—which came out on Blu-ray this week—was the evolution and continuation of Justice League, the animated series that brought together Wonder Woman, Batman, Superman and their allies as the Justice League for the first time on television. Unlimited, which ran for three seasons, also marked a bittersweet moment: It would be the final series in the DCAU, the vast and truly incredible pantheon of DC animated shows ushered in by Batman: The Animated Series in the early 90s, and overseen by the legendary icon Bruce Timm. What made Unlimited so special was where it took the already fantastic base concept that Justice League had. After two seasons, the show was rebranded and given a much wider remit. As it was in the comics, the Justice League evolved beyond the core team of seven heroes and added a gigantic roster of DC characters that became major supporting characters—and in episodes like “Patriot Act” or “Taskforce X,” sometimes even the stars of the show. Justice League had been very much rooted in the DC comics universe, and by becoming Unlimited it firmly entrenched itself, simply because we got to see so many heroes and villains in action. Although the main team still took most of the spot light, it wasn’t just them. There was a whole world of superheroes out there in the Justice League, and the show highlighted that vast legion. It would regularly swap out members of the team to use those characters as well, so they never felt like background players, but a vital tool in the series’ makeup. It made the show feel like it took place in a huge world, instead of being confined to a handful of heroes and rogues. In relation to that, one of Unlimited’s greatest strengths in this regard was that it used that scope not just to bring in more heavy-hitters, but to really explore the depths of DC’s roster—Huntress, the Atom, Doctor Fate, The Question, Star Girl, Booster Gold, Red Tornado, so many more were introduced to kids for the first time through the series. Even in the show’s twilight, in its third season, when the characters it could use were being restricted as Warner Bros. moved to capitalize on series that were not within the DCAU, like Teen Titans or The Batman, it played to those restrictions by shining the spotlight on some of the most obscure characters it could—the massive mecha STRIPE, the cowboy classic Vigilante, Shining Knight, Doctor Light, characters who might elicit a shrug of confusion from even an ardent DC fan. It took those characters and put them on the same level as a Superman or a Batman, gave them moments to shine that they never could have gotten, outside of the comics, in any other show. For many, JLU was not just the definitive interpretation of heroes like Hawkgirl, Martian Manhunter, even arguably Wonder Woman, Batman (I’ll go into this one specifically later), or Superman, but also some of DC’s most obscure heroes and villains too. The sense of scope carried into the show’s storytelling as well. One way that Unlimited differentiated itself from League was that it focused on single-episode stories rather than extended, multi-part adventures. It meant every week you could get something completely different—one week, an epic clash between Luthor and the League ripped right out of the climax of a huge comic book crossover event series, and then in the next, an episode about Gorilla Grodd using the souls of Nanda Parbat monks to turn everyone into apes. Unlimited experimented with some truly amazing episodes that played to the strength of that scope time and time again. The Rosencrantz and Guildenstern-ian “The Greatest Story Never Told”, had time-traveller Booster Gold playing a part in the background of a mission taken on by the main team. The Batman Beyond followup “The Once and Future Thing” really drove into the heart of Batman as a character. 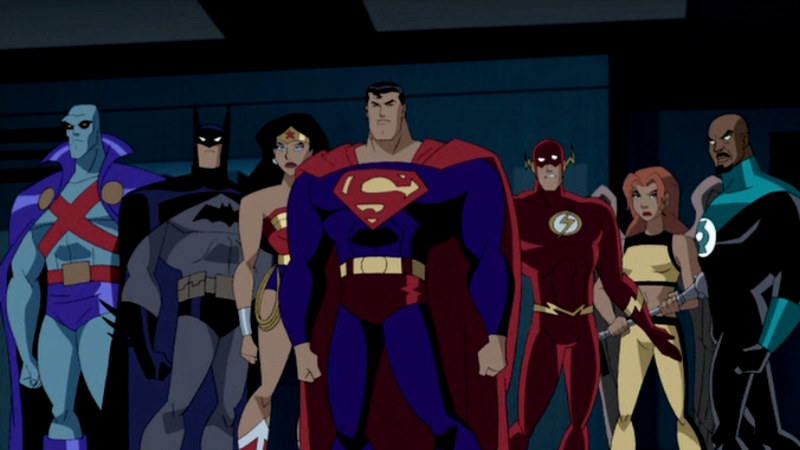 Even ludicrously silly episodes like “Kids Stuff”—where Batman, Superman, Wonder Woman, and Green Lantern all get turned into 11-year-olds by Mordred—or “The Great Brain Robbery”—where Lex Luthor and The Flash swap bodies and fail miserably at using it to their advantages—showed how the show could shine as a humorous adventure. Epics like “The Return,” where what felt like the entirety of the Justice League are fighting the power-absorbing Amazo Android, featured big-ticket action pieces that wouldn’t look out of place as the climax of a huge movie. There was such a variety that you never knew what you were going to get each week. Sure, you could put all of this down to the fact that, as a cartoon series, Justice League Unlimited wasn’t inhibited in the way a live action show can be. It could go big and crazy and have dozens and dozens of superheroes running around, with explosive action and superpowered fights that in any other format would cost you millions in funds and man hours to make. But the fact that Unlimited embraced that, and used that ability to truly capture the scale and size of the comics it was inspired by. It embraced its source material wholly, and dove straight in to create what is still one of the finest comic adaptations to this day, even as we champion shows like The Flash today for its own bravado in embracing the comic books it was born from. Justice League Unlimited was unafraid to be the wildest, biggest, comic-book-iest show it could be. I’ve talked about the show’s huge sense of scale, but Unlimited also excelled on a micro level as well when it came to its characters. The core team of the League were explored and transformed into layered, engaging, and fascinating characters that, as I said before, are for many the definitive realisations of these heroes. I’m not sure there are many who wouldn’t take JLU’s Hawkgirl over her immensely convoluted comic counterpart, for example. But one of the show’s greatest strengths in characterization, and what makes it still so important today, was that Unlimited was the culmination of one of the ultimate Batman iterations ever made: Kevin Conroy’s animated hero, the one that had been around on television since 1992. Being on and off TV for the best part of 15 years meant that the character had a lot of time to evolve and grow, but Unlimited polished off Conroy’s take on Batman, by softening the character’s edges just a little—his relationship with Wonder Woman, his deadpan humor, and capacity to care for and understand almost anyone—and sealed it as, arguably, one of the best Batman takes in or out of the comics. The second season finale of Unlimited, “Epilogue,” is a Batman-focused episode written without the knowledge that a third season was on the way. It tells a heart-wrenching story that connects The Animated Series, Unlimited, and Batman Beyond together with such deftness and heart that it still amazes today in the way that it closes the book on this version of Batman and gives him a happy ending that felt earned in a way so many other “happy endings” for Batman (looking at you, Dark Knight Rises) rarely ever did. And then it had the gall to go on for another season anyway and still have that episode matter! Unlimited did so much for so many DC heroes, but it still might just be its Batman that stands tall above the rest. In the end, Justice League Unlimited was—as it says in its title—unlimited in what it could do, regardless of whether it was at a grand scale or a small one. And no DC show or movie, no matter how good they are, has yet to come close.